Say you’re planning a November trip to Fairbanks with 1st Alaska Outdoor School, to see the famed Northern Lights. But you can’t see Aurora borealis all the time you are there, so what else can you do? Well here’s a rare sporting event that takes place annually in the heart of Fairbanks that the whole family can enjoy, the Yukon Title Curling Classic. The Yukon Title Curling Classic is a Team USA curling event, also known as a “cash spiel”; which is another name for a competitive tournament in which the winning team receives a cash prize for participating. The sport of curling is where players on ice, slide stones towards a targeted area that looks like a bullseye on ice. The stones are called “rocks” and two teams, made up of four players, take turn sliding the stones across the ice. Curling gets its nickname “chess on ice”, as it takes teamwork and planning on where to place each stone for points. Curling is one of the more popular sports in Fairbanks and this particular event is held November 6th to the 9th, and is hosted by the Fairbanks Curling Club. Past winning teams have included members of the Persinger family over the last four years. So if you’re looking to spice up your day while waiting for your chance to see the Northern Lights, check out this curling event. 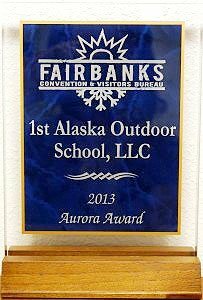 Or if you are looking to explore Fairbanks in other fascinating ways, contact 1st Alaska Outdoor School for all your tour needs.